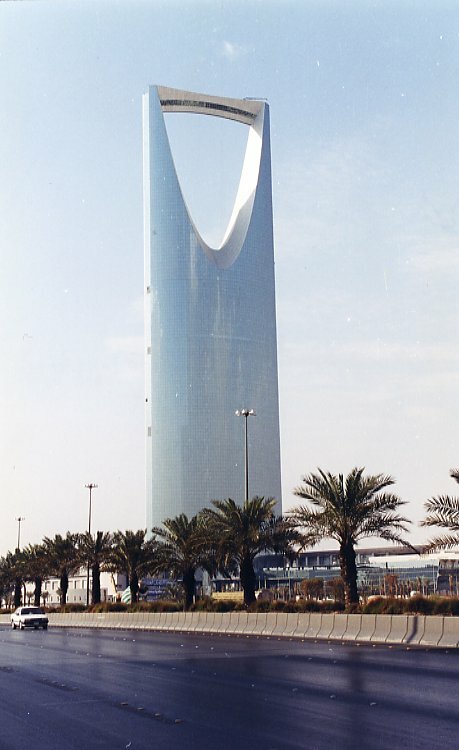 Riyadh, which lies in the Central Region, is the capital city of the Kingdom of Saudi Arabia and now rivals any modern city in the world in the splendor of its architecture. Broad highways sweep through the city, passing over or under each other in an impressive and still growing road network. Trees now bedeck the broad streets and avenues, giving pleasure to passers-by and shade to those who linger beneath them. Today the city extends for some 600 square miles (1600 square kilometers) and has a population of more than 5.8 million. The name Riyadh is derived from the Arabic word meaning a place of gardens and trees (“rawdah”). With many wadis (a former water course, now dry) in the vicinity, Riyadh has been since antiquity a fertile area set in the heartland of the Arabian peninsula. Of all the Kingdom’s developmental achievements, Riyadh is perhaps the most obvious and accessible to the foreign visitor. From the moment he lands at the King Khalid International Airport, itself a marvel of design wedding the traditional Arab style with the best of modern architecture in a happy marriage of spacious practicality, the traveler is aware that he has reached a city that must be counted one of the wonders of modern times.